President Cheryl Brickey called the meeting to order at 1:00 pm. Seventeen people were in attendance. Cheryl reminded us to sign up on the web site: www.greenvillemodernquiltguild.blogspot.com to receive information on our monthly meeting date and location as it may change depending on availability of the library. Cheryl and Marilyn will continue to work on the by-laws which will be presented for input and discussion at the April meeting. Everyone who attends this meeting will get a door prize. Cheryl has designed the free March pattern of the month for MQG. Darleen has contacted the Meyer Center regarding our donation of a quilt for their auction. She does not have any definite information at this time. The March program was a recap of Quit Con attended by Cheryl, Brenda and Paige. Cheryl and Brenda talked about the workshops and lectures they attended. 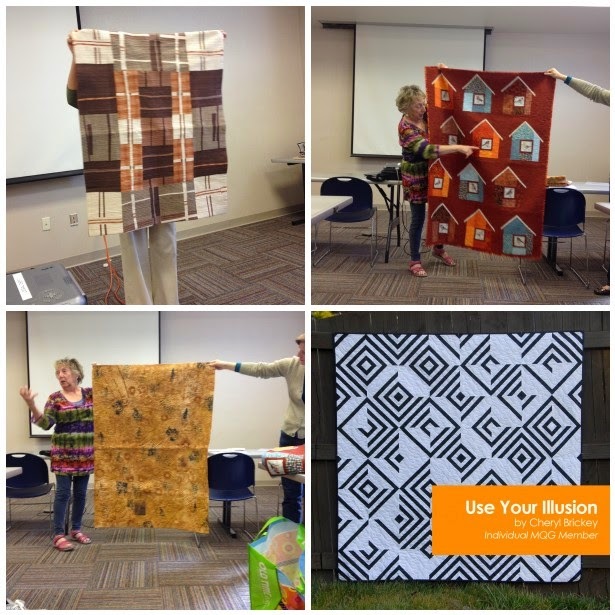 Cheryl showed the blocks she made in the Gee's Bend workshop. We also viewed pictures taken by Paige (some some by Brenda and Cheryl) of many of the quilts hanging at Quilt Con. Brenda won a paper pieced Christmas Star block donated by Darleen and Darleen won 3 fat quarters donated by Cheryl. May 9th @ Taylors Library: Big stitch hand quilting by Debby West. Information and supply list will be in a later post.